It is no secret that Indian Point, the nuclear power plant in Buchanan, NY is located in a bad place, namely a county of one million people and in the northern region of a 20+ million person metropolitan area. It is no secret that it is slowly leaking radioactive water into the environment. It is also no secret that many people want it closed. Since I have grown attached to being alive, I’d be just fine with the thing gone, all things being equal. However, I’m a little spoiled. You see, I like having electricity. Among the most vocal critics of our poor exit strategy in Iraq are people who have no exit strategy for alternative energy sources to Indian Point, which makes it’s closure, in my view, a pipe dream. I asked an advocate today what Plan B would be for energy, and he admitted that there really isn’t a magic bullet, which I suppose is the polite way of shrugging his shoulders. I’m all for conservation, reducing waste, consumption, and streamlining distribution. However, those things don’t produce a watt of juice to power my computers, copiers, fax, or phone. We could all have airtight houses with R-120 insulation ratings and furnaces that are so efficient that they recycle newspaper into Jello, but the fact remains that electrical use will always rise due to technology, not fall. If you are uncomfortable with being within 50 miles of nuclear fission I can relate. It is one town away from me. But if you want to remove our power source and have no other feasible means of producing clean energy, I think you’ll lose my support. 10. "They told me at the blood bank this might happen." 9. "This is just a 15 minute power nap they raved about in the time management course you sent me to." 8. "Whew! Guess I left the top off the white out. You probably got here just in time." 7. "I wasn’t sleeping! I was meditating on the mission statement and envisioning a new business strategy." 6. "I was testing my keyboard for drool resistance." 5. "I was doing a highly specific yoga exercise to relieve work-related stress. Are you discriminatory towards people who practice yoga?" 4. "Darn! Why did you interrupt me? I had almost figured out how to handle that big accounting problem." 3. "Did you ever notice sound coming out of these keyboards when you put your ear down real close?" 2. "Who put decaf in the wrong pot?!?" Number one best thing to say if you get caught sleeping at your desk….raise your head slowly and say, "In Jesus name, amen." This is Bella, the younger of our two dogs. When I am a couch potato she likes to act like a hassock. At that end of the couch, our two year-old likes to play this game where she puts toys on the arm and then push them overboard. 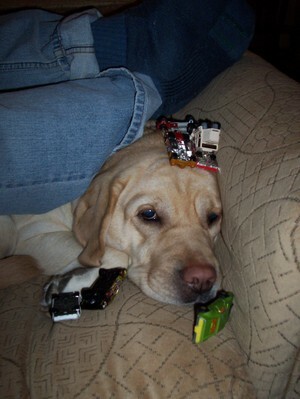 In this case, Bella was either too lazy or comfortable to let the little metal cars landing on her head bother her. So they piled up. Only 22,000 square feet? What a dump. A $50 million offer was turned down already. Cheapskates. And it’s a Tudor? I’d have to rehab it. It’s difficult to ascertain who the owner is. Title is held in a corporate name tied to offshore investments. I couldn’t find the property on the Multiple Listing Service, and the broker’s site didn’t have it up either, but I did find this one. And this one. The guy on TV asked the panelists if they knew how to pronounce "nuclear." He said it bothered him that the President said "nukular." The show was from 1978. The President was Jimmy Carter.